Moving Connections is a professional moving company serving the Wasatch Front with shipping and moving services for more than thirty years. You will not find a local moving service more dedicated to providing seamless transitions for residential and business moves than Moving Connections. We hire only experienced professionals for our moving teams and we are committed to helping Utah residents find the best service for their money. That’s why we offer a cost-saving “labor only” option as well as a full service option for residential moves. So click on one of the choices below to find out more about our services at Moving Connections. If Moving Connections is moving you to Riverton it's a perfect time to begin to utilize the many resources and bounties of Riverton. For example click on the picture to the left to go the Moving Connections 'Support - Advice - Assistance' page and discover Riverton for the first time. Once you are on the 'Support - Advice - Assistance' page go ahead and open the .pdf link found there and tape the list of emergency and useful phone numbers on your refrigerator. 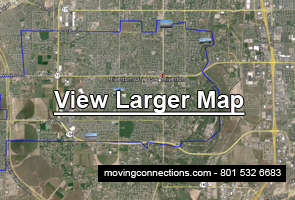 Moving Connections has gone to great pains to find those links and connections to integrate you quickly into Riverton life. If you’re looking for the peace of mind that comes with a full service move, then Moving Connections has the right option for you. With the full service move, you are relieved of the tensions and burden of attending to many dozens and even hundreds of nerve-fraying details involved in a move. Just let our professional Riverton residential moving crew handle all of those details while you tend to other matters. With the full service move, Moving Connections will send two (or more) men to your residence in a clean, fully stocked 26 foot moving truck. Our professional moving team will carefully stretch wrap your furniture and other large and heavy items, which they will then load and strap in according to moving industry standards. The team will transport the goods to their new location and there carefully unload and unpack the items and place them where they belong according to your instructions. Many families and individuals are looking for a way to get the most bang for their buck, and that’s just as true for moving as it is for any other expense. That’s why Moving Connections is a Moving Company offering the budget minded “labor only” move. With the labor only move, you provide the truck (usually a rental) and the driver (usually you). You can also participate as much as possible in the packing of many household goods, particularly those items that are not too big or too heavy. All of the loading will still be done by Moving Connections’ professional moving crew because this is something that requires professional loading expertise. But this can save you a lot of money, and the more you have to move and the farther you have to go to get to your new home, the more you save. This is because Moving Connections has a very straightforward pricing formula for its services: you pay for our crew’s time (driving and labor) plus boxes and tape. So by doing much of the packaging, plus all of the driving to the new destination and the unloading and unpacking there, you stand to save bundles of money on Moving Connections’ labor only move, so named because our crew provides the labor only, not the truck. If you’re a professional business person, then you deserve a professional moving service like Moving Connections. Moving Connections is in business for real. We’re small enough to be local and very responsive, but large enough to be true professionals. And how are we more professional than most of the other moving companies? First, Moving Connections is federally licensed, bonded, and insured for your peace of mind. Second, Moving Connections hires only experienced professional movers for its moving teams. And third, Moving Connections has a clear and unambiguous pricing formula so that you don’t get stuck with any surprise expenses at the end of your move: no fuel surcharges, no junk fees for equipment usage, and no taxes. You just pay for the crew’s labor and driving time, plus boxes and tape.